I guess you could say that I’ve started looking for land for my cabin in the woods. Although the search sort of began in 2009, a heavy debt load made it pretty much impossible for me to close any deal I might stumble upon on my periodic internet searches for raw land. The debt is for the most part gone now, so the search is in earnest. My goal is to own property by the end of September. I got sidetracked last year when I discovered HUD houses and HUD auctions. I got pre-approved for an FHA loan and put in a couple of bids on homes that would have been adequate for me and provide me with home fixing projects to last me well into retirement. I even put in a contract on a log cabin in Madison that would have been perfect for me, until I had it inspected and discovered that the structural and electrical problems it had would have made it cheaper to build one from scratch. So I gave up on searching for inexpensive houses and returned to my quest for land. 1.5 acres, with most of it along the slope of a hill. So far things have been interesting. A 1 1/2 acre site in Cheathem County with the asking price of $15,000 turned out to be a 50 x 100 lot with a backyard that sloped down the hill at about a 60 degree angle for several hundred feet. It was covered with tires. A 10-acre site in Hickman County that advertised harvestable timber was actually a gully on a steep mountainside that would have required a helicopter to get those logs out. It was full of trash, too. Today’s search was better. A little more than 11 acres with a creek at the front of the property, $28,500. It was at the end of a gravel road, about 60 miles east of Nashville. A few acres of cleared land and the rest was forest on a steep mountainside. You had to drive across the creek to get to the land. Getting in or out after a heavy rain might have proven tricky and driving on that road after a snow could be downright challenging. But the views. Man the views. This was a pretty piece of property. I had to drive a mile up the road to get a cell signal to call the real estate agent. Sadly, someone already made an offer and the seller accepted it yesterday. The search has reaffirmed the reason I want to own raw land in Tennessee in the first place. Tennessee is a beautiful place. My Roland and Bryan ancestors learned this more than 200 years ago when they settled here for a couple of generations. It’s fun following in their footsteps. I don’t know whose house is on the top of that hill, but they’ve got a great view of this valley and more. With last week’s hurricane and earthquake affecting dozens of friends, I thought I’d show how I am prepared for when the power goes out during a natural disaster. The easiest part is communications. I bought a 7-inch battery powered TV two years ago, when the government pulled the plug on analog TV. The portable TV is able to get all of the Nashville area channels using the handy antenna I built out of scraps earlier this year. It also has a 12v plug so I can use it with my car battery or the marine battery I bought to run my key machines when I had a locksmith business. While that’s neat, radio is still the most reliable way to learn about what’s going on around you during a disaster. I picked up a hand-cranked radio for $5 when Sharper Image went out of business a few years ago. Crank for 30 seconds and you have 30 minutes of power. I also bought a solar-powered light from Tough Stuff, a non-profit that sells solar powered lights and battery packs in Africa for villagers to use in place of kerosene lamps. The light was neat but for whatever reason, it died after a year. 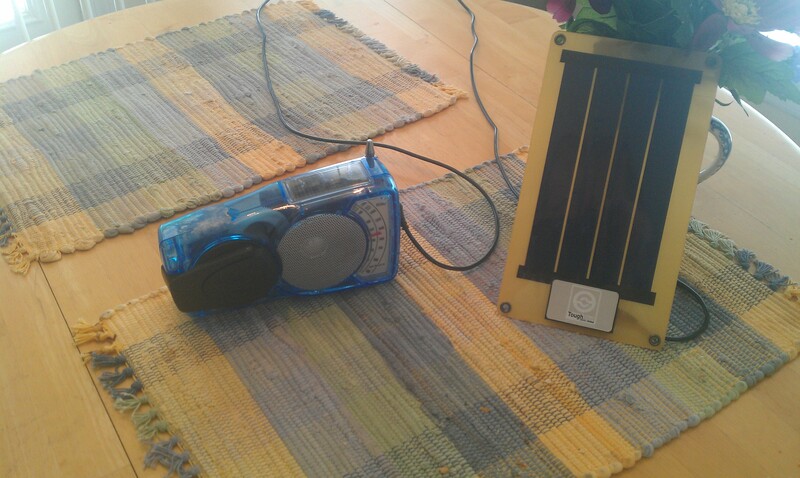 In trying to figure out a way to still use the 6v solar panel that came with the light, I discovered that it was compatible with my Sharper Image radio. So I put the solar panel in my home office window and plugged it in to my radio on top of a bookcase nearby. Two years later and I’ve never had to crank the radio battery to use it on camping trips or to catch a Saints or LSU game on WWL-AM after dark. A friend forwarded a link to a story in Florida Today about a man who went off the grid in desperation. He bought a 45-watt solar system, three batteries and used a ceiling fan to make a wind generator after he smashed his electric meter because he couldn’t pay the bill. While I admire his fortitude, he hasn’t made a mortgage payment in 3 years, so I hope all his work is not in vain. That’s not how I want to do it. I plan to build a smaller house than the one I have now, wire it for both AC and DC power and furnish it with energy efficient appliances like a refrigerator, dishwasher and washer and dryer. An air conditioner would be included, although I’d heat the home with wood. The idea is to not have to pay utility bills when I retire. The goal is to pay for it as I go along without a mortgage so that when the day comes, I can use my 401(k) for having fun without worrying about a house note or electric bill. I saw an article on a professor in Lafayette, La., in Solar Today a few weeks ago and posted a link on Facebook. Rick Portier, a college friend of mine who’s a first-rate videographer in Baton Rouge, did a story on it this week. Professor Corey Saft estimates that the home’s monthly utility bill will be about $20 a month. The home relies on some neat technology. For instance, he’s got a heat pump connected to his water heater. 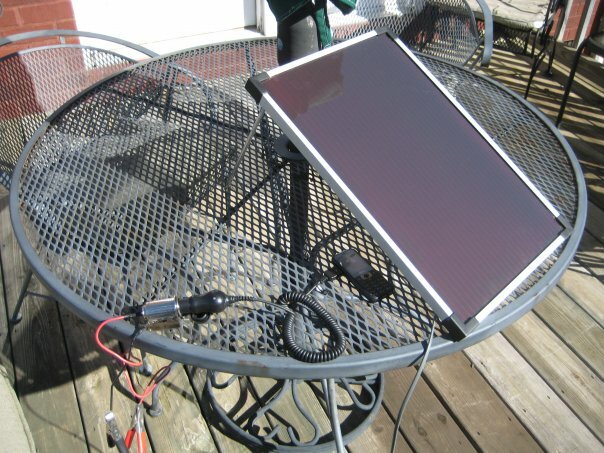 He has a grid-tied solar power system, too. But much of the energy savings comes from efficiency. The home is super sealed with SIP walls construction, double paned windows and heavy-duty weatherstripping around the doors. Professor Saft estimates that the house is so well sealed that a candle is sufficient to heat it. Of course, keeping a house warm has never really been a problem in South Louisiana. But the home relies on things like tall ceilings and using peg-board for stair risers to aid in ventilation. You can read Rick’s script at this link. You can see Rick’s video here.